Let's face it, the younger generation (i.e. 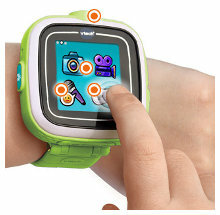 kids) deserve a smartwatch just as much as us older tech-savvy folks. Vtech, the maker of an assortment of kids electronic toys, aims to provide it for them. The Kidizoom is a smartwatch designed specifically for kids and, at around $59, it's really not a bad deal for the functionality it provides. The watch receives high reviews on Amazon and, according to parents, younger kids seem to really like it. The Kidizoom has a pretty amazing number of features for the price. Of course, it tells time (with a bunch of digital and analog clock faces). Additionally, the watch includes a camera and games that are all accessible through a "home" button and a touchscreen. The watch is designed for kids ages 4 and up, and that's right about the age when they are learning to tell time. To help them along, the watch includes a program that has an owl that will speak the time displayed on a clock. With 128 MB of RAM, the watch can store about 800 photos or about 6 minutes of video (60 seconds each). These can be uploaded to a computer via the included USB cable. A number of games are included that help kids improve their memory and have fun, including a voice recorder that has wacky voice-changing effects. Additional games can be downloaded by parents. Speaking of parents, the watch includes parental controls that allow parents to set daily time limits for how long kids can play games on the watch. Options are 30 minutes, 60 minutes, 90 minutes or no time limit. The rechargeable battery takes about 3 hours to fully charge and that should power the watch for about 2 weeks. Of course, we all know that battery duration depends completely on how much the watch is used and most kids will probably be playing with the Kidizoom non-stop for the first few days (be prepared to recharge often during this time). The watch looks a bit large and over-sized on a small wrist. Although this may not be completely aesthetically pleasing, it does provide a decent sized touch screen for kids to use. The watch comes in several colors that should please most kids. So if your youngin wants to have a smartwatch just like mom or dad, this may be an inexpensive and educational way to make that happen.